Hebrew author; born in Dubrovna, Russia, Oct. 29, 1850. His father, Alexander Frumkin, when sixty years old emigrated to Jerusalem (1860). 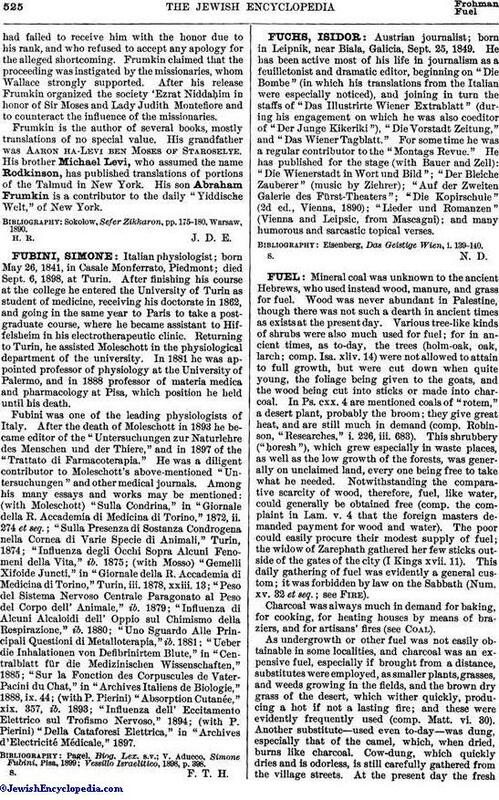 In 1869 Frumkin edited the Hebrew semi-monthly newspaper "Ḥabaẓẓelet," which had been founded in Jerusalem by his father-in-law, Israel Back, a printer, a few years before, and a few years later he edited a Judæo-German weekly called "Die Rose." The latter, owing to lack of support, was soon discontinued. "Ḥabaẓẓelet" was changed to a weekly with a literary supplement; it is still being issued. Its publication was spasmodically interrupted through the intrigues and machinations of the zealots of Jerusalem, whom Frumkin constantly denounced for the lack of reform in the "ḥaluḳḳah" system. Recently, however, he became reconciled to the management. In 1883, for reflecting upon Gen. Lew Wallace, the American minister to Turkey, in an editorial in "Ḥabaẓẓelet" (xiii. No. 6), headed "An American and yet a Despot," "Ḥabaẓẓelet" was suspended, and Frumkin was imprisoned for forty-five days, by order from Constantinople directed to the pasha of Jerusalem. The incident which caused the editorial was the dismissal of Joseph Kriger, the Jewish secretary and interpreter to the pasha of Jerusalem, at the request of Wallace, who complained that Krigerhad failed to receive him with the honor due to his rank, and who refused to accept any apology for the alleged shortcoming. Frumkin claimed that the proceeding was instigated by the missionaries, whom Wallace strongly supported. After his release Frumkin organized the society 'Ezrat Niddaḥim in honor of Sir Moses and Lady Judith Montefiore and to counteract the influence of the missionaries. Frumkin is the author of several books, mostly translations of no special value. His grandfather was Aaron ha-Levi ben Moses of Staroselye. His brother Michael Levi, who assumed the name Rodkinson, has published translations of portions of the Talmud in New York. 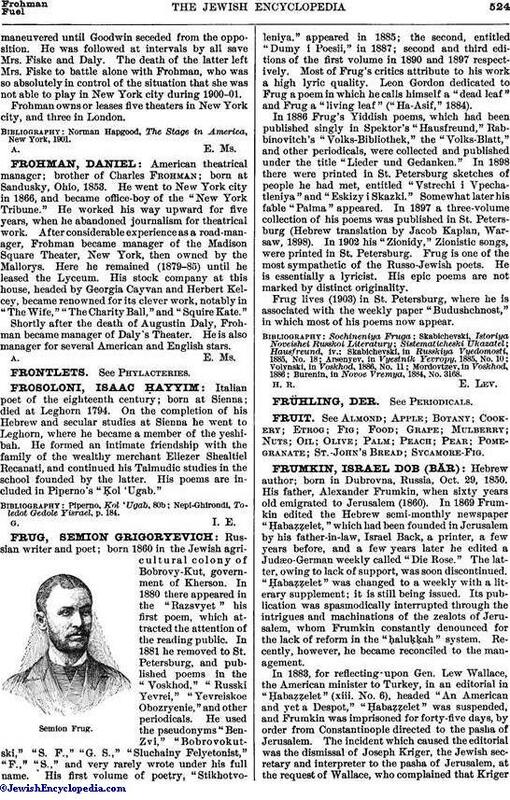 His son Abraham Frumkin is a contributor to the daily "Yiddische Welt," of New York. Sokolow, Sefer Zikkaron, pp. 175-180, Warsaw, 1890.